David Pipe is the son of the infamous Martin Pipe, a handler widely accepted to have influenced the way that horses are trained nowadays. He introduced a new, scientific approach to racehorse training and was renowned for having his horses hard fit. Pipe junior took over the reins several years ago and has had plenty of success in his own right. In this article we try and uncover some trends and traits in Pipe’s training methodology, identifying when his horses offer betting value, and when they should be avoided. His runners need to be respected at Towcester and Plumpton, where their strike rates are superb. The West Country handlers tends to bring his backwards types out to local track Exeter, and is yet to have a debutant winner at the course. It is with 4 year olds that David Pipe does best when it comes to bumper newcomers. His strike rate is very high, he produces a big profit and the A/E is impressive. Pipe’s novice hurdlers don’t really exhibit any particular trends or biases in performance. His maiden/novice/juvenile to handicap switchers have a moderate record. Horses typically need 3 runs before they qualify for an official rating and can run in handicaps. Overall, Pipe is 17/170 (10%) with these runners, producing a loss of £-86.09 and an A/E of 0.77. Those runners that are unfancied (10/1 or bigger) can be disregarded by punters, as they are 0/54. 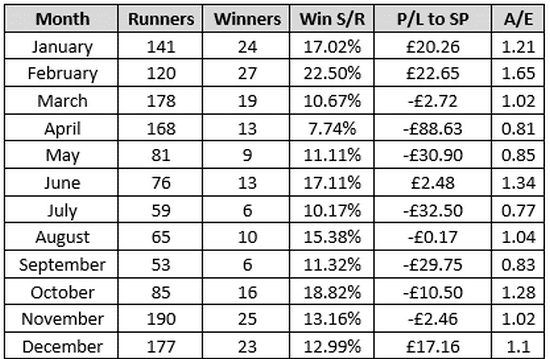 Pipe’s last time out winners who are turned out within a week have a particularly high strike rate, produce a decent profit and have a good A/E. They should be followed. His winners who have been off the track for more than 4 weeks have a contrasting record; 11/136 (8.09%) for loss of £-84.21 A/E 0.52 and make good laying opportunities. In January-February, Pipe’s handicap chasers are 51/261 (19.54%) for £42.91 LSP, A/E 1.41. He does much better from October-February than he does from March-September. When they have been off for 8-14 days, they have a very good strike rate, profit and A/E. However, when his runners have had a mini-break (off for 57-90 days), they do the best, winning nearly 80% more often than the odds imply they should do. Pipe does very well with bumper debutants at Towcester and Plumpton. His runners should be avoided at Exeter. He is most profitable with 4 year old newcomers to bumpers. If they do not win on debut, Pipe’s bumper runners provide poor value next time out. David Pipe doesn’t have a great record with his hurdlers who switch to handicap company, especially if they are unfancied in the betting. They make good laying opportunities. He does best with handicap hurdlers in December and January. His last time out winners racing in handicap hurdle company do well when turned out quickly, but are poor value when off for more than 4 weeks. 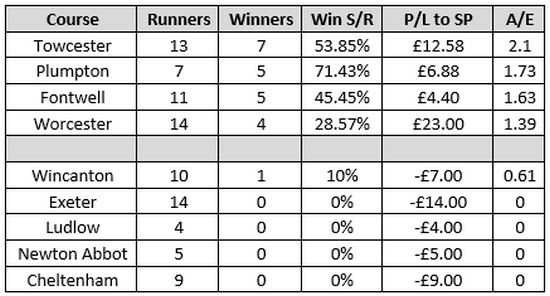 Novice chasers do very well in September-December. 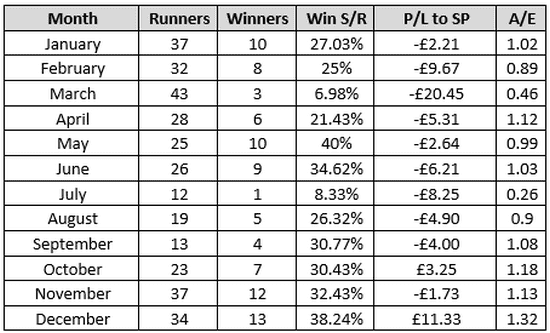 Pipe’s handicap chasers have a very profitable record in January and February. His horses are good value with claimers aboard, particularly when turned out quickly and favourite.